EZ RNA Clean Up Kit can be used to clean up RNA from crude RNA preps or after enzymatic reactions such as labeling reaction, RNA ligation or DNase digestion. The kit is designed based on selective binding of RNA to silica membrane in the presence of chaotropic salts. The crude RNA is mixed with RNA Lysis/Binding Buffer and the mixture is then loaded onto the silica membrane-based spin column. Any impurities are removed by subsequent washing steps. The purified RNA is eluted in RNase-Free Water. The purified RNA is suitable for conventional RT-PCR, real time quantitative RT-PCR, northern blotting, RNase protection assay, RNA amplification for microarray analysis. High Quality RNA with E Total RNA was isolated from mouse liver using phenol–based RNA extraction method and was then purified with EZ RNA Clean-Up Kit. 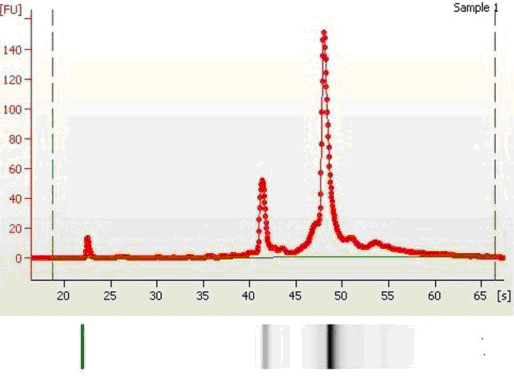 The RNA was analyzed with Agilent 2100 Bioanalyzer.